From Ted Lindsay through a number of greats and now it’s been handed to Edmonton Oilers’ phenom Connor McDavid after an unbelievable season by the young forward. The award was originally named the Lester B. Pearson Award, but renamed after Ted Lindsay April 29, 2010. It’s awarded to the most outstanding player in the regular season voted on by the members of the NHL Players Association – an association started by the namesake of the award. McDavid is just the 25th player to win the award in its 43-year existence. He earns the award after finishing the regular season with 30 goals and 100 points in 82 games for the Oilers leading them back to the postseason. He finished 11 points clear of Sidney Crosby for overall points and seven assists clear of Nicklas Backstrom for the top spot during the regular season. While he didn’t win the award, Crosby should also be recognized for his outstanding regular season. He finished second in points (89), first in goals (44) and led his team to yet another outstanding playoff run (even though that doesn’t count toward the Ted Lindsay Award). As for Brent Burns, what more can be said about this back-and-forth defenceman. He finished top-10 in overall points with 76. He notched 29 goals and 47 points in 82 games for the San Jose Sharks while playing a physical game and topping all defenceman in points. He finished with a plus-19 rating and 25 power play points for the Sharks. He led all Sharks in goals (tied with Joe Pavelski) with 29, assists (47) and led the way in points. In 2016, it was the tenacious Patrick Kane who was named the Ted Lindsay Award winner. The Chicago Blackhawks star played all 82 games for his team and notched 46 goals and 106 points in the process. 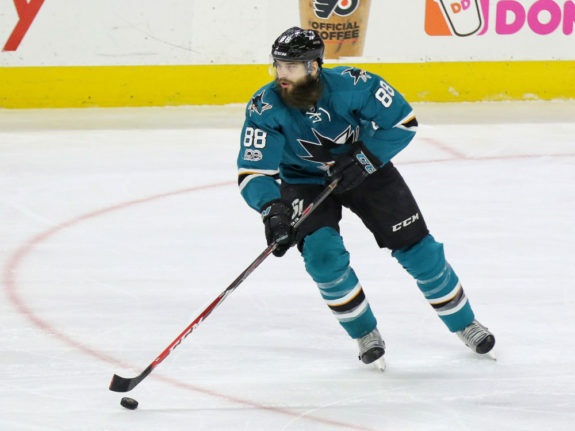 He finished second in the league in goals (behind Ovechkin who had 50), third in assists (behind Joe Thornton and Erik Karlsson) and first in points. It was the first time that Kane was awarded the trophy and he became just the 24th player in 42 years to earn the award. This was the first NHL award of McDavid’s career as he missed most of his rookie season with an injury. Still, it’s a heck of an accomplishment coming into your sophomore season in the NHL and winning the Ted Lindsay Award.